This Policy Brief argues that the citizen-led assessment approach should be used to implement, monitor and establish country owned accountability mechanisms for the post-2015 development agenda. International IDEA’s State of Democracy, State of Local Democracy and Democratic Accountability Assessment Frameworks (developed as global public goods) offer a basis for designing such a framework. 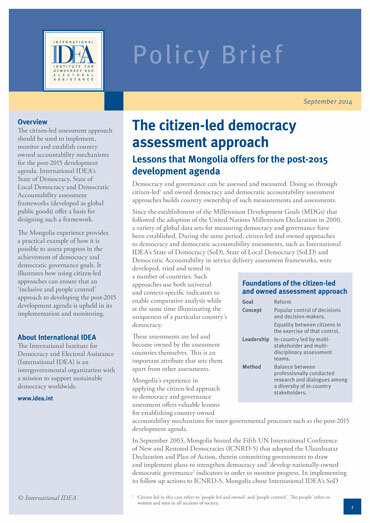 The Mongolia experience provides a practical example of how it is possible to assess progress in the achievement of democracy and democratic governance goals. It illustrates how using citizen-led approaches can ensure that an ‘inclusive and people-centred’ approach to developing the post-2015 development agenda is upheld in its implementation and monitoring. Participants of the public forum on Strengthening Public Service Accountability through Citizen Participation in Ulaanbaatar on 6 December 2018. Image credit: Municipality of Ulaanbaatar. Left to right: Koh Miyaoi, Gender Team Leader for Asia, UNDP; Siprianus Bate Soro, Team Leader of Democratic Governance and Poverty Reduction Unit, UNDP Indonesia; Maria Leissner, Secretary General of the Community of Democracies; Leena Rikkila Tamang, Director, Asia-Pacific Office, International IDEA; Patricia Galdamez, Civil Society Coordinator, Community of Democracies.